As we pass the shops on the main streets in the city centre, we also pass small reminders of York businesses of earlier centuries, recent centuries, when many people crammed into the city centre to work and live, behind the buildings fronting onto the main thoroughfares. Old street directories list many small courts and yards behind the larger properties. Some are well-known and still in use, accessed via a narrow passage or wider opening between buildings. Others are gated off, used as service entrances for 21st century businesses, while still bearing the names of owners from centuries past. The photos on this page show two names still visible, on main streets in the city centre, one marking a rather large entrance archway, another a narrow gated passage. Breary had his court, Ayre had his yard. An 1895 directory suggests that Mr Ayre was a ‘provision merchant’. I’ve no information on who Breary was, apart from that, as is often the case with surnames in the old days, it varied, Brearey or Breary. 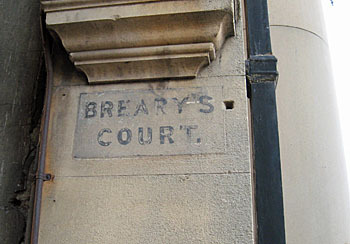 Hargrove’s 1818 book on York mentions ’several good houses of modern construction’ in ‘Brearey’s Court’. More modern developments are often given rather contrived names, named after poets, or the Cumbrian lakes, or Yorkshire reservoirs. Or perhaps alluding to history, even if apparently rather out-of-place. In the old days these yards and courts and the like clearly got named naturally and logically after the owner/occupier. Presumably by the people who knew them and used them, and later these names were adopted by the street directories. By Lisa @YorkStories • 29 May 2012 Signs and symbols, Streetscape To link to this page's proper location please use the > permalink. Hi Lisa, my late grandmother, born at the turn of last century, Mary Ayres, was the daughter of Mr Ayres who inherited the business from his father Mr Ayres who owned three grocery shops in York. 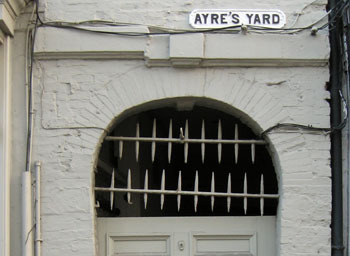 The name Ayres was mis-spelt at some point and Ayres Yard became Ayre’s Yard. That’s very interesting, thanks Vivien – those apostrophes do cause confusion don’t they. Modern signs have the right idea I think in tending to miss them out altogether. It’s a city council thing! I have been searching for the yard to show my children when we visit from Nottingham. I have seen it a couple of times only, my gran and grandad Mary Ayres and husband showed me when i was about 8 and then I found it again on a visit as a teenager. Now in my mid fifties I have looked in vain. My dad is the son of Mary Ayres and he tells me it is close to Petergate. I shall follow your map next time.